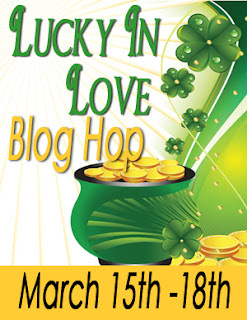 Kelly Gendron: Lucky in Love Blog Hop! So, are you lucky in Love? Do you have the Perfect Mate? for a chance to win a $10 Amazon e-Gift Card. He shoved his hand into the pocket of his jeans. His eyes, if at all possible, became darker, almost black, but his expression remained impassive. “You have dirt on your face,” he said flatly and remotely, as if he’d expected her impulsive reaction. “Oh.” Her hand went to her cheek, the one he had planned to innocently wipe off for her. She rubbed it, wondering if she’d overacted. What was she going to do when he freely walked around her house, took a shower in her bathroom, or slept in the bedroom below hers? Was she going to jump with every step he took? Was she going to lay awake all night? And the shower—her shower. Rainey decided thinking about Tex McCoy naked in the shower wasn’t a good idea. He was a killer. But he already served his time, right? Was he…reformed? Wait, was she really trying to rationalize here? It was manslaughter, not murder, right? And he did claim self-defense. Right. Then why’d he brutally stab Curtis Watson multiple times? The questions swarming through Rainey’s head were undoubtedly the same questions the jury had asked. Their answer to that question had earned Tex the maximum sentence of fifteen years. The unanswered question that remained was why Tex McCoy and Curtis Watson, a hired hand who’d worked at the McCoy ranch three years prior to the murder, had gotten into a brawl outside of the bar in the first place, the scuffle that eventually led to Curtis’s death. For the sake of her son, Rainey had to believe Tex was reformed. She had to trust he had no other choice and that he had a damn good reason for killing Curtis Watson. “Oh,” she breathed, backpedaling until she hit the wall. “Good.” Her body went still. He was standing just inches from her. He wasn’t touching her, but she felt pinned against the wall just the same. He lifted his hands and placed them alongside her head, resting them on the wall. Now, she was literally pinned. His eyes drifted to her mouth, and every nerve trembled from the inside out. She wanted to run. Her breathing seized, and her heart had stopped midbeat. Fear was winning. He leaned forward, and his dark lashes lifted until his eyes met hers. “You look scared,” he said, in a voice so low, ominous, and deep that it shook her insides. His hand came from the wall, dark lashes lowering once more. He gazed at her lips. They were quivering, but at that moment, Rainey couldn’t have cared less if he saw it. She was terrified. Warm fingers scraped her shoulder, slithered up her nape, and gripped around her neck. His fingers indented her skin, and being strangled came back to mind. This Hop has TWO grand prizes. You as a reader can go to EACH blog and comment with your email address and be entered to win. Yep, you can enter over 200 times! Great giveaway, thank you :) Im looking forward to reading your new book! Great excerpt! I'm adding to my TBR list. Thanks for the giveaway. I have the perfect soul mate. We have been together for 18 years and still going strong. He supports everything I do and like and always has my back. And he spoils me rotten..... just the other day he bought me a new nook because I was complaining about the battery not lasting long on my old one. Such a sweetie! No perfect mate here. Do they exist? I was lucky and found him by accident! No, I am not lucky in love. I haven't met my soul mate yet, but then again, I'm not actively searching. Following you all over and happy to be here! Hope you'll stop by my post and do the same! I am very lucky in love, and so thankful. Congrats on your new release, Kelly! Great excerpt! Thank you for the wonderful giveaway. I hope you have a fabulous weekend, Kelly! So far not lucky in love, but I'm hopeful! I have many wonderful examples around me, so I truly hope I get to be just as lucky. I don't have my search engines going, but I keep myself open to the possibilities! Not lucky in love yet. Thanks for the great giveaway! I follow on GFC Ellen Thompson and facebook Ellen Driver Thompson. Fatal Promise sounds like a great book and I can't wait to read it. I have the perfect-for-me mate. We have been together almost 20 years. He accepts me for who I am and never tries to change me. He does his best to provide me with things he knows I would like. I love him more every day. Still looking, but I feel lucky not to have chosen badly! I haven't found my perfect mate, but I'm not currently looking. Thanks for the giveaway! Amazing! Thank you for the chance to win! I follow you with GFC as Lisa Walker. Thanks for the chance, and I loved the excerpt! The above exerpt was great, I am looking forward to reading the book in full soon! No luck in love yet..
Hope you had a great St. Patricks Day! Thanks for participating in the hop! looking for that special someone!! Haven't found him yet though :( Thanks so much for the great giveaway and joining in on the hop!!! awesome giveaway! Happy st patrick day! I got lucky in love :-) I met my husband when i was in high school and we've been together for 15 wonderful years! Thanks for the chance to win! I have my perfect mate - married 41 years.